Over our dead body (as opposed to that other dead body!). Community Board 9 doubled-down on its rejection of a city safety plan for upper Amsterdam Avenue on Tuesday — and, in fact, specifically argued that the changes should not be made even though pedestrian Erica Imbasciani was run down on the speedway-like stretch last week. “The Board is adamant that this tragedy should not be used to force these [safety] measures on us,” board Chairman Padmore John said at a hastily called press conference to address several days of media focus on the board’s years-long opposition to the redesign between 113th and 162nd streets. 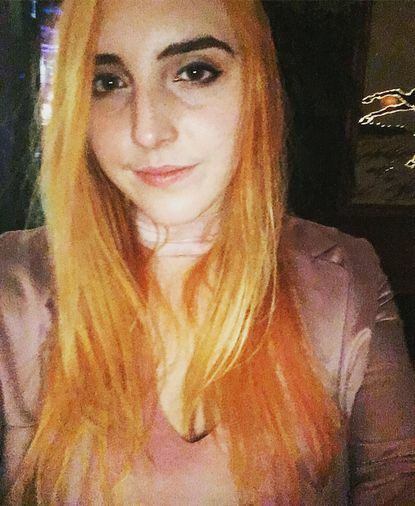 She cited five deaths along the roadway, plus 36 severe injuries between 2010 and 2014 (in all, since the DOT first presented its plan to CB9 in March, 2017, there have been 927 reported crashes on that stretch of Amsterdam, resulting in injuries to 27 cyclists, 58 pedestrians and 116 motorists, plus the death of Imasciani). “It is time to redesign Amsterdam Avenue to prioritize the safety of our fellow neighbors and residents,” she concluded. But the board’s latest round of demands — which are so tiny in an overall 50-block plan — that they reflect more than just a different view of engineering from the professionals at DOT. John said that the board doesn’t trust the city. If, indeed, CB9 supports the broader redesign effort, as John contends, it would represent a major shift in the panel’s thinking. 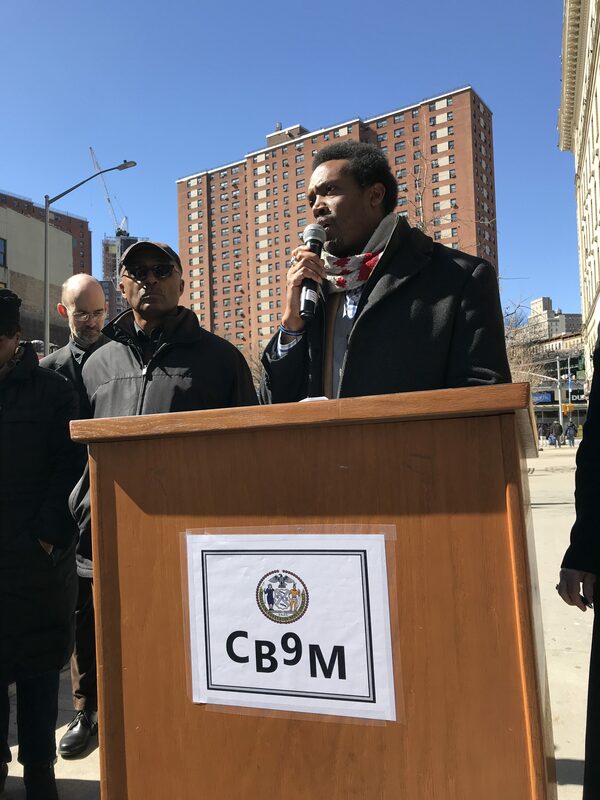 For two years, CB9 has thrown up many roadblocks to the safety plan, with Transportation Committee Chairwoman Carolyn Thompson repeatedly arguing against removing a lane of travel because it would allegedly cause congestion, a contention that reams of data have shown is unfounded. “You’re still removing a lane. And that’s what we don’t want,” she said in 2017. Streetsblog asked Brewer why she doesn’t replace recalcitrant members of CB9 with new blood that supports street safety. Thompson, for example, has been on the board for three decades and has steadfastly objected to street redesigns, bike lanes and other safety improvements. Brewer has reappointed her several times. She denied she was frustrated with the board’s open defiance of a safety plan she favors. So good attendance is more important than whether or not they reject life-saving street designs that could have stopped a death like Erica’s? Give me a break. This is shameful. what a stupid and offensive thing for the bp to say. these deaths aren’t real to her. only politics are. DOT is spinning its wheels with this outdated plan for double-parking zones disguised as bike lanes. Where’s the physical protection? Give CB9 the best and dare them to vote it down. Ugh this is despicable. If anything, the proposed plan should be strengthened to better protect peds/bikers. And it should be instituted immediately. The law only requires notice to the boards, not their sign-off. Ugh. Saw that too. I’m sure Erica’s family is not too happy. Just wish the plan called for Protected Bike Lanes. Community boards are advisory only. Community boards can huff and puff, but there is no legal requirement to get community board approval to paint a bike lane. For most people (other than those with city jobs) the last time attendance counted for anything was when they were in kindergarten. Sorry, just showing up doesn’t count for much, especially when all you’re doing is warming the seat like most of these board members appear to be. Also, can Erica’s next of kin legally sue the board members who opposed this design? They should be able to. Board members who oppose designs proven to save lives sue be personally liable for any deaths/injuries which result. Brewer simply doesn’t care. It’s still astounding to me that an advisory Community Board, appointed by a vestigial office of Borough President is given any legitimacy in 2019. We shouldn’t wait for a tragedy to make our streets safer. We should redesign streets before people get killed. She’s not as bad as that remark. But the remark is inexcusable. Exactly right. Community Boards have no legitimate role in decision-making. The important point here is that we have elected representatives who are charged with the responsibility of making policy in the public interest. If any of the half-wits and lunatics on a Community Board want to be involved in this process, then they are free to run for office. Until then, these ignorant idiots should be told to sit down and shut up while the competent adults are busy working. As opposed to a unanimous 23-2 vote? CB9 believes killing a few innocents is “worth it” to save a couple of minutes travel time. These people are scum, there’s no other word for them. Same goes for every other “community” board that opposes safer streets. I put “community” in quotes because they have nothing to do with community. If they cared about their communities then they would take an interest in protecting everyone in that community, not just a select few car owners. From now on I’m going to refer to them as “carmmunity boards,” because that’s what they god damned are. It’s not even to save travel time, it’s the perception of faster travel on a wider street. Study after study has shown that speeding and passing does not save time overall, while calmer streets actually improve travel times.